United States: Postmasters Provisional St Louis 1845-46 5 cents, unused. 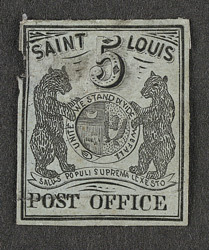 bl.uk > Online Gallery Home	> Online exhibitions	> Philatelic rarities	> United States: Postmasters Provisional St Louis 1845-46 5 cents, unused. Before the first issue of postage stamps was ready for use in all parts of the United States in 1847, local Postmasters made provisional issues. The provisional stamps for St Louis, Missouri were 5 cents and 10 cents values, showing the Missouri Coat of Arms and were designed and printed by J M Kershaw. Printing was from a copper plate with three 5 cents and three 10 cents in a sheet of six and 500 were so produced. It was later altered to include 20 cents values.